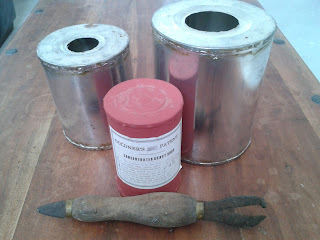 Replica 1, 2, and 4 pound cans, plus "Lever knife"
A few years ago I visited the vaults of the National Maritime Museum to do some research for a mini-project of mine, to make some replica Goldner cans. Later, after piecing together photographs of the fragmentary surviving labels, I was surprised to discover that the labels include a picture of a can-opener to the left of the text and on the right an illustration of how the opener was intended to be used. 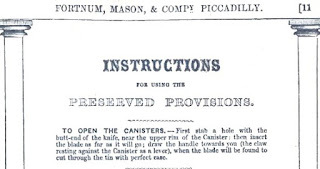 That the cans and labels date to 1845 is not in doubt, thus an article in a well known on-line encyclopedia which states that "dedicated can openers appeared in the 1850s" clearly needs to be updated. The can opener depicted (referred to as a lever knife in contemporary sources) has a short stabbing blade at one end for puncturing the can, and at the other end a claw comprising a blade to continue the incision and a projection for a fulcrum. The text on the can says "To open, stab a hole with the but–end of the knife insert the knife and cut it round." 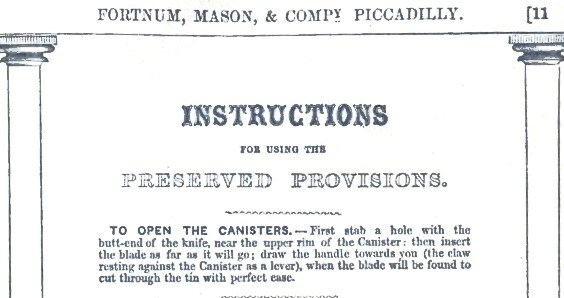 Fortnum and Mason's 1849 catalogue also includes very similar instructions for opening preserved provisions canisters. In 1851, when Goldner was still the Navy's main supplier of preserved meats, the Admiralty declared: "The canister is to be opened with the lever knife furnished for the purpose, and is to be cut completely round the body near the top." Preserved meat manufacturer John Gillon of Leith claimed, in 1840, to be the inventor of the lever knife although the device described is slightly simpler with no mention of the short stabbing blade. Vintage can openers similar to that depicted can sometimes be found for sale. I prided myself that the one I bought was a genuine 1840s relic and probably the oldest can-opener in the world until I discovered that the company which made it, F G Pearson & Co. of Sheffield, was only established in 1854. The true "oldest can opener in the world" therefore remains on the list of treasures which are waiting to be plucked from the icy depths of Erebus and Terror. Very interesting, Peter! So a can opener is a lever knife. I can imagine that the inventor previously was using a regular knife to open cans, and decided an improvement was needed. I myself have opened plenty of cans with regular knives, and it is time consuming. I've stories of bayonets being used as can openers more frequently than being used for fights.